Smart Pots are planting containers that use plants' natural abilities to prune their roots and develop additional root mass in small volume spaces to sustain better health, reduce plant stress and provide an improved end product. Their innovative approach allows plants to increase root density without becoming rootbound in the same way as in other small container plantings. 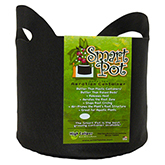 Created initially to aid in reducing transplant shock in trees, the developers of the Smart Pot soon extrapolated the benefits to smaller plants and garden settings. Smart Pots are now found being used indoors and outdoors as well as for a variety of plantings and crops (flowers, edible plants, dwarf trees). Similar to other air pruning methods, Smart Pots utilize natural plant reactions in low humidity air to redirect energy into forming branching root systems, which provide more efficient nutrient and water uptake, increase foliage growth and improve overall plant health. Air pruning is advantageous as it encourages new roots to sprout, helps branched root systems develop and discourages roots from spiraling. Always use Soil Mediums with high water holding capacity, like Coconut Coir, when planting in Smart Pots to make the most of your efforts and avoid flushing nutrients out of the container unnecessarily.